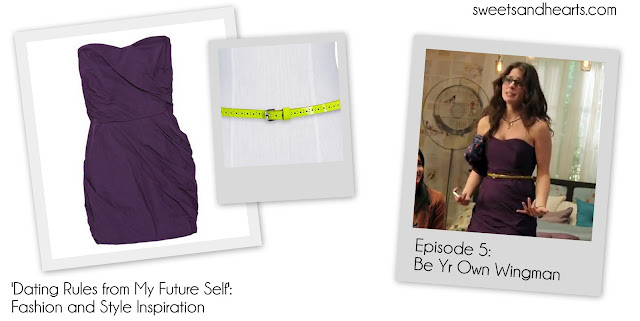 'Dating Rules from My Future Self' Fashion: Ep. 5 - "Be Yr Own Wingman"
In episode 5 of Dating Rules from My Future Self, Lucy's friends tell her to get out and move on. Before hitting the bar scene, they convince her to wear a cute little strapless dress. 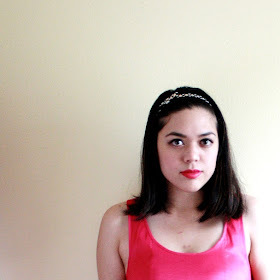 ...but who cares, because look how cute she accessorized the dress? As usual, Lucy puts her own spin on the plain purple dress by mixing it with unconventional accessories and an unexpected color combination (violet, neon yellow, and a little bit of turquoise). It's a little pricey, but I'm almost positive this is the exact dress that she's wearing (Juicy Couture; originally $400, on sale for $200). Pair the purple strapless mini dress with a patent neon yellow skinny belt. Add a chunky turquoise goldtone bracelet and a layered multi-chain necklace. It's impossible to see her shoes in this episode, but I think these crocodile textured leather brown pumps pull the look together nicely. You can watch episode 5, "Be Yr Own Wingman" here. More Dating Rules fashion to come! Read fashion re-caps for previous episodes here.